About the Brand O3 - This is India's No.1 Professional Skin Care company since 2005, catering to professional beauty salons, stylists, dermatologists and cosmetic surgeons . PRESENTATION - White easy squeeze plastic tube packing,sturdy ,spill proof cap ,easy to carry.This has a jelly like consistency and is white in colour. Take a pea size amount on your palm and use on wet face , gradually lathering up and then rinse well with water.Apply on the face in circular motion, massage gently and rinse off. Use daily. 5. Does not make the skin dry, it helps in retaining the moisture and restore epidermal balance and thus increases skin’s tolerance to environmental damage. 7. Recommended by salons world wide. 3. Does not deep clean or remove makeup , in that case , I use a micellar water or biphasic cleanser and then wash that off with this facewash. FINAL VERDICT - It seems like a great product,if you are looking for something mild and gentle for your skin or if you have sensitive skin like me( also good when you are using anti-ageing creams or acne creams that can make the skin very dry and you may need a gentle facewash that does not strip away the skin's moisture). I rate it a 4/5. It does what it claims . If you have no other skin problems,it is a good find specially for combination or sensitive skin. O3 is a great brand. I didn't know they had regular use face wash as well. Will check it out. They have a whole range of salon products for every skin concern. Yes, but since I am already using an anti acne skin care product which helps with the blackheads, I opted for a face wash that is mild and does not irriate or dry the skin. Oh yes,they have different products for that. Seems to be a good product. O3 is a reliable brand too. I loved the detailed n unbiased review of the product. Thank you for liking the review Aritra. It is mild and gentle too, you may try it. 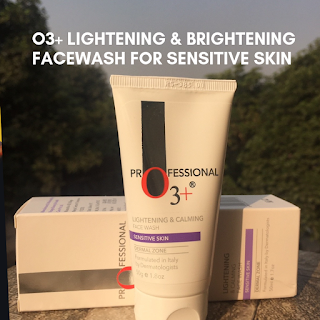 I like O3 as a brand and they do have good products. I love skin care products and am particular about my skin. This looks like a good purchase and since the salons are using it too, I'm sure it's reliable as well. Thanks for the share Preeti. Nice to know of brightening options for sensitive skin types as me. I've always had to stay away from these brightening creams considering they had an adverse effect on me. The small packaging is a good option for the trials.. grt info. Since I suffer from acne and post acne pigmentation , I need to use skin lightners frequently .This doe snot show drastic change but gives a nice over all glow to the face which lasts and does not make my skin dry or irritate it.